Please read all instructions before installation and to check to see that all parts are included. 1. Remove locker kit from packaging. 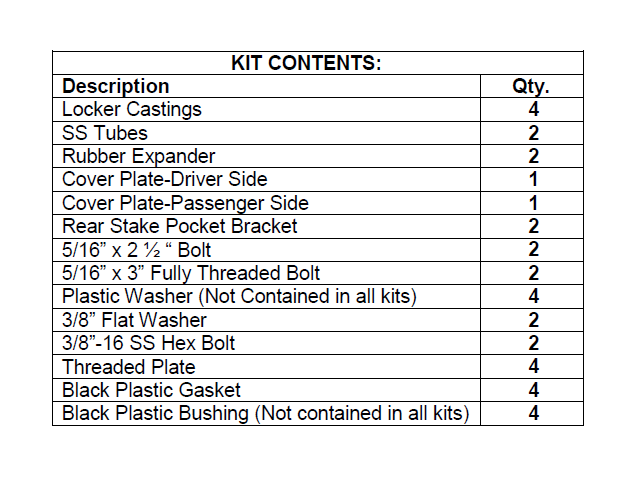 Verify all parts from above kit contents table are included. 3. Assemble castings and mounting hardware for the front two stake pockets. Put plastic washer on the bolt and insert the bolt through the top of the casting. 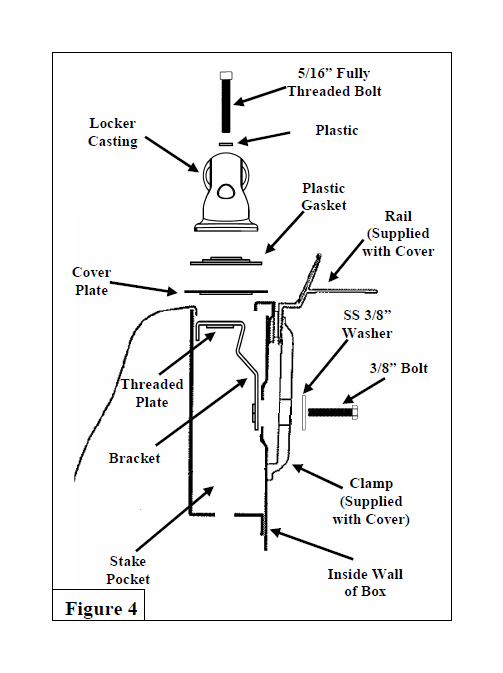 Insert the gasket, expander, and threaded plate on the bottom and finger tighten and place in front stake pockets as shown in Figure 1 on page 2. 4. Place a bushing on each casting so that the tabs face towards the tube. 8. Install the 3/8” bolts with washers into the clip nuts on the rear brackets through the inside surface of the truck box. Tighten with 9/16” wrench as shown in Figure 2. 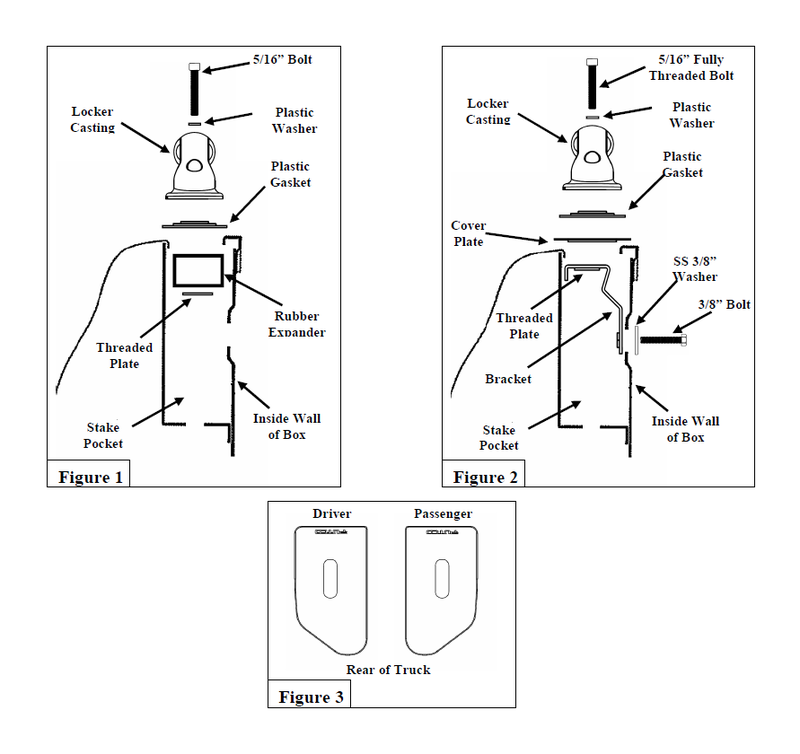 (If installing with tonneau cover, use Figure 4 for rear mounting bracket installation. If 3/8” bolt doesn’t fit through clamp supplied with cover, the hole in the clamp might need to be enlarged with a 7/16” drill bit. See Putco catalog or contact Putco for the “Diamond Donut” option to mount your rails directly to the side of your toolbox. assembled casting into the rear stake pocket. 3. Center the front casting, left to right, on your truck’s bed rail near the toolbox. 4. Mark the center of the hole in the casting on your truck’s bed rail. 4 above and drill straight through the bed rail of your truck. plate and tighten with ¼” hex drive. 8. Repeat the steps in this section for other side.